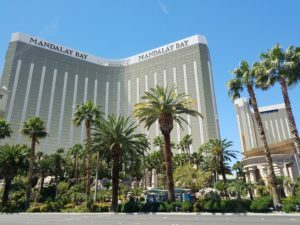 The 2019 Atlassian Summit user conference took place in the Mandalay Bay Conference Center. On April 9-11, over 5,000 customers, Solution Partners, and Atlassians descended on the city of Las Vegas, Nevada. 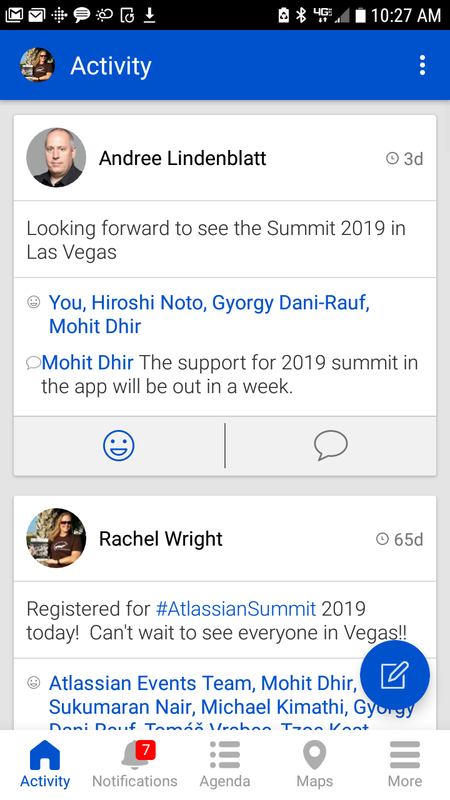 Will you be at Atlassian Summit, in Las Vegas, from April 9-11, 2019? 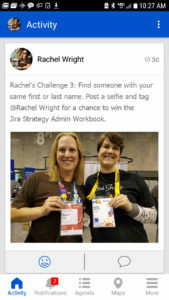 Meet Rachel Wright and win her Jira Strategy Admin Workbook or one of her 30 minute, role or skill based, online training courses! 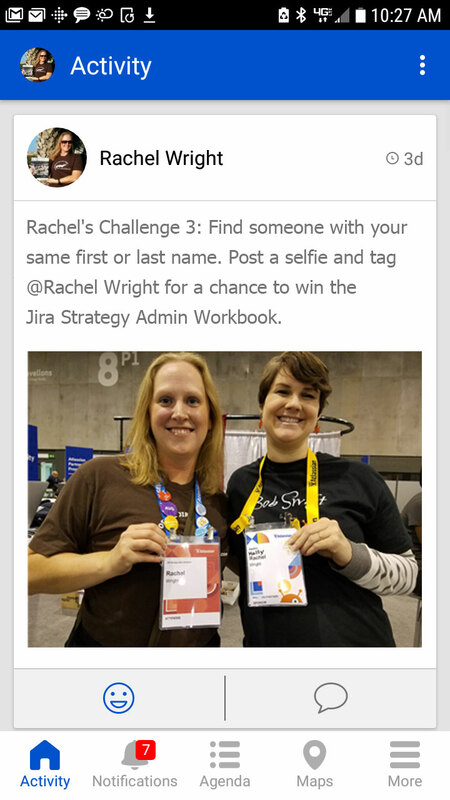 Rachel is hosting a photo challenge in the Summit mobile app. Post a photo of the completed challenge and tag @Rachel Wright for a chance to win! The more challenges you complete the better your chances. Creative posts receive bonus points! Download the Summit mobile app from the Google Play or iOS Store. Also spot Rachel and Chris Lutz walking the conference floor, in the Atlassian Community Lounge, attending sessions, and enjoying Summit! Is this your first Summit? This is my eighth! Attend the First-Timer Welcome Reception to hear survival tips from Summit alumni and Atlassian Community Champions Rachel Wright and Fabian Lopez. The reception is on Tue, Apr 9 at 3:00 PM in the Mandalay Bay Shoreline Expo Hall. First time in Las Vegas? See my Summit Travel Guide. Not at Summit? 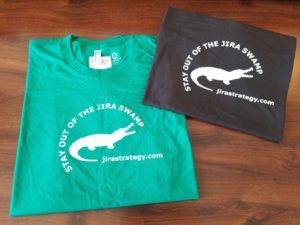 Use coupon code SUMMIT for 15% off your order in the Strategy for Jira store! The Jira Strategy Admin Workbook is different – it’s not documentation. It’s over 150 recommendations that stem from years of cleaning up horrible Jira configurations. This book includes 32 real life examples of what NOT to do, over 50 worksheets to get you organized, and templates, code snippets, and wording samples to help you establish and streamline processes. Summit is the grand Atlassian event of the year. With the palpable enthusiasm of the employees, the knowledge of the presenters, and the immense networking opportunities, this is the place to experience all that is Atlassian. Add the next annual event to your calendar now. Visit summit.atlassian.com for details. My two favorite things in life are Atlassian Summit and travel! Atlassian’s flagship event, the annual user conference, is in Las Vegas Nevada this April. This will be my eighth Summit and my fourth trip to Vegas! I took the Mandalay Bay photo above in 2006. By now I know a lot about both and am excited to share my conference travel tips. Make a checklist list of what you plan to accomplish and who you’re hoping to meet at Summit. What do you want to learn from Atlassian? Which Solution Partners will you seek out? I always have a list of names, contact information, and where I might find each person or company. Las Vegas is a 24 hour city in the middle of the desert. It’s hot, dusty, expensive, exciting, thrilling, and like no other place I’ve been. Here are some tips to help you get around while you’re in town for the Atlassian conference. The conference is located in an area of Vegas known as “the Strip.” Most of the iconic pictures you’ve seen are probably of this area. The Strip is 4 miles (6.4 k) long and stretches from Mandalay Bay to the Stratosphere Tower. There’s also an area 10 miles (16 k) north known as “downtown”, “old Vegas”, or “Fremont Street”. I’ve stayed in both areas and love them for different reasons. Both have an abundance of casinos, glitz, food, and entertainment opportunities. When you’ve done everything you wanted to do on the Strip, head downtown for a different vibe. If you’re staying on or near the Strip, there’s no need to rent a car. Parking is difficult and traffic is plentiful. Most casinos charge for parking and its never cheap. Instead, use a taxi or a ride-share service, like Uber or Lyft. Download and create an account in one of these mobile apps before you arrive. Taxis don’t stop on the Strip; catch one from a casino or hotel instead. Bring good walking shoes and expect to walk a lot. Casino properties are huge and are further apart then they look. Your steps add up while you’re weaving between them and traversing pedestrian foot bridges. There’s a great map of all the major casinos here (.pdf format). I know some of you have planned a pilgrimage to In-N-Out Burger (fast food hamburgers) on Dean Martin Dr. Please don’t attempt to walk there; it’s not as close as it appears. Also, there are plenty of other (cheap and expensive) hamburger options. There’s an elevated, electric tram between the Mandalay Bay, Luxor, and the Excalibur casinos. Get on the free Mandalay Bay Tram from the north east corner of the conference casino, past Starlight Tattoo and the House of Blues Restaurant & Bar. Information on other casino trams is available here. Whether you’re walking or driving, always be aware of your surroundings. There’s a lot of activity and a lot of distractions. The traffic lights operate differently here than in other states. If I remember correctly, the green left turn light fires after the straight light turns red. Always cross the street in marked locations or use pedestrian bridges. Be especially careful if you stop at the “Welcome to Fabulous Las Vegas Nevada” sign. It is literally in the middle of a busy road. 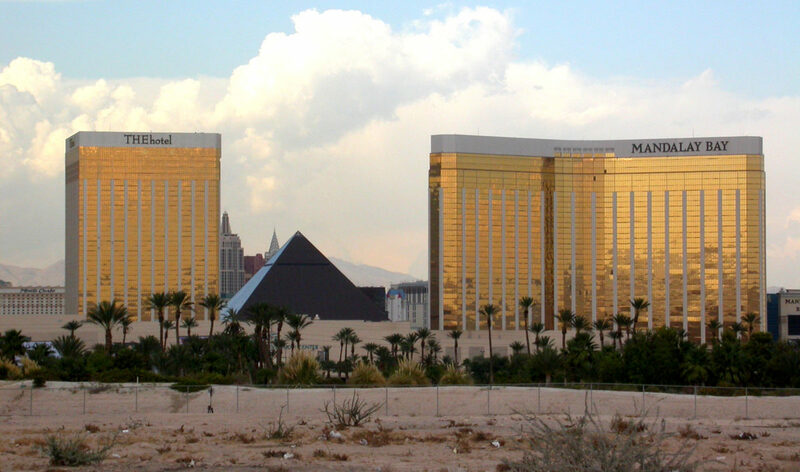 In 2008 they finally added 12 parking spaces which are accessible when heading away from the Strip. Mandalay Bay, our conference hotel, has table games and slots, 30 restaurants, a Starbucks, and loads of entertainment and nightlife options. It also features the Shark Reef Aquarium ($25 USD), a 1.6 million gallon wave pool with a quarter-mile-long lazy river (free for hotel guests, $20 for non-hotel guests Mon-Thurs), and shopping at Mandalay Place. If you’re in Vegas for additional non-conference days, I encourage you to venture out and explore the other casinos as well. Each one has a unique flavor and interesting things to see. I love the steam rising from manhole covers at New York New York, the Eiffel Tower at Paris Las Vegas, and the canals of Venice at the Venetian. It’s not as amazing the real thing, but it’s still fun to see. Many casinos and hotels have both free and paid attractions and shows. The most popular free attraction is the water, music, and light show called “Fountains of Bellagio” at the Bellagio. See other free attractions here. Rêve or a Cirque de Soleil show like “O“. They are also variety shows, magic shows, adult entertainment, comedy shows, concerts, and special interest performances like Zombie Burlesque! When researching entertainment, the first place I look is the “Things to do” area of TripAdvisor. 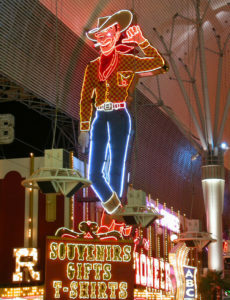 Also get ideas on sites like: lasvegasnevada.gov, vegas.com, and visitlasvegas.com. Atlassian feeds you well on conference days, so you won’t have to worry about food. But on other days, there’s no shortage of options or cuisines for every budget. For an “all you can eat” or variety experience, the legendary Vegas buffets are the place to be. My top three favorites are: Wicked Spoon at The Cosmopolitan, The Buffet at Wynn (especially their Friday and Saturday “seafood spectacular”), and Le Village Buffet at Paris. For similar food at a cheaper price, eat at lunch time instead. This year, I’m excited to visit the Eataly Italian marketplace at MGM. Eataly is in 12 countries but the Vegas location just opened in Dec 2018. If there’s time, I hope to check try dining in the dark at Blackout. I also promised Chris Lutz he could get his uni (sea urchin) fix at Nobu at the Hard Rock. The air is very dry in this part of the United States. Avoid dehydration by drinking more water than normal. It’s easy to exceed your budget if you don’t limit your expenses. The sales tax in Las Vegas is 8.25%, so don’t forget to factor that in. Also, don’t forget about the daily resort fee that’s added to your hotel cost. At Mandalay Bay, the daily fee is $37 plus tax. Gratituties add up too. Here’s a guide to tipping in Vegas. If you need a common health or travel item, there’s a Walgreens (drugstore & household products) and a CVS Pharmacy 1.4 miles (2k) from the conference hotel. Convention center rooms are often cold. If you forget your jacket, buy an Atlassian hoodie at the Summit swag store, or head to Marshalls (clothes, accessories, and shoe store), 1.3 miles (2k) away. Marshalls and the drugstores are near MGM and prices will be lower than casino shops. Keep track of receipts so it’s easy to enter your expenses when you return home. On each purchase receipt, record how you paid (credit card, local currency, home currency) to make filing expense reimbursement reports easier. Provide your credit and debit card companies with your travel dates so they know to expect away from home charges. Avoid a fraud alert or hold on your accounts. I once had a debit card and a credit card, from two different banks, declined at the same shop. This was very inconvenient. Prevent it by taking action before your trip. Las Vegas has a free-for-all reputation. But many things you may have heard are legal simply aren’t. I encourage you to do you own research and check out the Las Vegas Metropolitan Police Department’s website for official information. Also, cameras are everywhere (even outside.) Don’t recreate the movie The Hangover! Do you have extra time in Vegas? A few days under glittering casino lights may have you craving time outdoors. There are many neat places nearby to visit. You’ll need a rental car or to join one of the many tours that leave from Vegas. I recommend arranging tours online before you arrive. Notes: Your last chance to stock up on fuel and water is at the Moapa Paiute Travel Plaza at the corner of I-15 N and Valley of Fire Highway. This year I’m taking a side trip to Death Valley National Park. I love the national parks and this is one I’ve always wanted to visit. 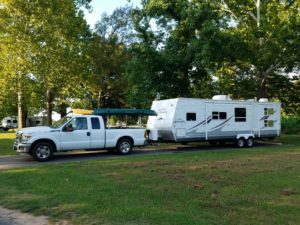 I’ve been on an RV road trip since May 2015. I work from home, and “home” is wherever I park for the week, month, or quarter! By the time Summit begins, I’ll be in my 54th city. I track all my RV trip planning details in Confluence, but when there are flights involved, I track those trips in Tripit Pro. I like this service because it monitors flights, alerts me when gates change, turns confirmation emails into travel entries, has both a web and mobile version, and keeps me organized. There’s no wrong way to craft an itinerary, just make sure you have one, it works for you, and it’s easy to access when you need it. I store my trip packing list in Confluence. I print it out or check off items on my phone as they go into my travel bag. I also plan conference specific activities with the Summit mobile app. 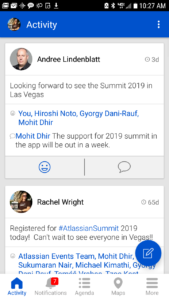 Look for it listed as “Atlassian Events” in the Google Play or iOS store. Use the agenda feature to plan sessions and activities, the map to help you find your way to a Solution Partner’s booth, and the messaging feature to connect with fellow attendees. Many of us are still tagging each other and chatting away in the app long after the event has ended. Check the weather. The season may be opposite from home. The historical average temperature in April is a high of 76°F (24.4 C) high and a low of 53°F (11.6 C). Leave your itinerary and emergency contact information with a team member and a friend or family member. Purchase travel insurance to get reimbursed for charges related to missed or delayed flights, lost luggage, medical and emergency issues, etc. I buy insurance for all international trips and selected domestic trips. In 2016, the date of Summit changed to the same week I was scheduled to be on vacation in Iceland. I canceled my vacation, got reimbursed for my expenses, and attended the conference. I’ve only had to use insurance once and I was sure glad to have it! Your credit card might include travel insurance. Mine once allowed me to cancel a flight at the last minute with no penalty. Take all the same safety precautions you’d take in any large city environment. Always walk with a friend or fellow conference attendee. Look like a tourist. Walking around with your head buried in a map (or a phone) advertises don’t know where you are. Join large crowds, gatherings or demonstrations. Your presence can escalate into an international incident. I once witnessed a demonstration in Buenos Aires. My travel companions wanted to move closer and see what it was about! Not smart. I talked them out of it. Count money in public, wear valuables, or be an easy target. Advertise your travel plans. It’s safer to post to social media after your trip. Become a victim of theft, “mustard” scams, and other scams typical in major cities. Scammers are everywhere tourists are. Beware of pick pockets, especially in busy areas where people are easily distracted. (Example: Fremont Street) Store your money in separate locations so if you lose some you don’t lose it all. Keep your passport locked in the the hotel safe. Finally, beware of people asking for financial help. Last time I was in Vegas, a man followed me into the elevator and told me he just lost his wallet and needed my help. It was most certainly a scam. Finally, don’t walk around town wearing your conference badge! It shows you’re a tourist and probably don’t know your surroundings. But remember to bring your badge to get into conference events, like Summit Bash. If you’re a frequent traveler, become a member of the TSA Pre Check program. If you’re a frequent international traveler, join the US Customs Global Entry program (which includes TSA Pre Check.) The convenience far outweighs the application process and cost. I’ve also heard you can shorten your wait in the Customs line using their (free) mobile app. NOTE: Not every US airport has Pre Check. Further, the Pre Check line may be closed during non-peak hours. I learned both the hard way. Have you filed your taxes yet? The deadline for submitting your 2018 income tax return is Monday, April 15, 2019. April 15 is also the last day to submit 2018 retirement contributions (IRA, Roth IRA, SEP, etc.) and the due date for paying Q1 2019 estimated taxes. I’m getting all this stuff out of the way before Summit! Read customs regulations, so you know what to expect when entering the United States and reentering your country. Read the US Customs and Border Protection’s “For International Visitors” pages. Record the location of your nearest embassy or consulate. You may need to go there in an emergency or if you lose your passport. Research credit and debit card international transaction fees. List any fees on your company expense report. They may be reimbursable. Download and print OANDA’s “Traveler’s Cheatsheet”, a wallet-sized currency converter. Exchange a small amount of cash at home before you leave and then at a local bank once you arrive. The worst exchange rate is at the airport. Bring additional local and foreign cash for emergencies. Keep it in a separate location. Bring original purchase receipts for expensive technology items. One country attempted to tax one of my team members for his (not new) laptop on his return trip home. Thankfully I only have recommendations and no passport-specific horror stories to share. Research passport and visa requirements. Make a color copy of your passport’s photo ID page. Store a digital copy in your email and on your phone or laptop. Bring a printed copy with you and store it in a different location than your physical passport. If your passport is lost or stolen, alternate copies are vital. Leave your physical passport locked in a hotel safe. Don’t bring it sightseeing or to conference sessions. If you lose your passport, report it to the nearest embassy or consulate. Have you: Been stuck on a plane? Made an emergency landing in an unexpected city? Been trapped in an airport for an extended time? All have happened to me. Always plan for the worst and hope for the best. Never board a plane without water and a snack. These came in handy while stuck on the tarmac in Costa Rica. Supplies on my grounded plane dwindled quickly. Always bring a blanket. For long flights I bring a small pillow. These provided welcome comfort on many cold flights and while I was stuck in South Carolina and Peru airports. I use a sleeping bag liner from ALPS Mountaineering. It’s warm, soft, and rolls up to fit in my backpack’s water bottle holder. I’ve used it as a blanket, sleeping bag, pillow, towel, and a makeshift changing room. I’ve yet to discover the perfect travel pillow. This year I’m testing out the ComfoArray. The Nemo pillow I tried last trip is great for camping, but not for airplanes. Always know what kind of airport you’re passing through. I travel very light, bringing only the things I absolutely can’t live without. Consider what you packed on your last trip but didn’t use. Leave those items at home. Most things can be obtained or borrowed from a fellow conference attendee. I truly believe there are only two types of luggage: carry on and lost! My bag was lost after an 18 hour flight. When the airline finally found and delivered the bag, it was someone else’s! After that experience, I always carry my own luggage. Have you ever seen a family lugging a cart of bags around the airport? How about someone with the entire set of nesting suitcases? Don’t be that traveler! I used to bring a backpack and a small roller bag until I noticed my boyfriend only carried a backpack. Now I only bring one backpack and I make sure I can comfortably carry its weight. I’ve spent hundreds of dollars testing out suitcases and travel bags. The very best is my $60 USD High Sierra Access Backpack. I take it to every Summit and I’ll take it on a 200 mile walk I’m planning, on the Camino de Santiago, in Spain. Make a game of packing. Each trip, see how few items you can bring and how much weight you can reduce. I try for a total weight of ~20 pounds (9 kg), regardless of trip duration. On long hikes, I try to stay under 10% of my body weight. Other reasons not to over pack: airlines charge for carry on luggage or heavy luggage, and you’ll want to be able to fit the new t-shirts you acquire at Summit! A small amount of planning and organization will help you get the most out of this super event. Read my survival tips for things to do before, during, and after Summit to make this your best conference experience ever! Have a great flight and I’ll see you at Summit! I’ve attended Atlassian Summit since 2013 and as a frequent attendee, I’m always excited to see what’s new each year. Each Summit is totally different. Over the years the venues have changed, the focus, content and activities have changed, and most of all I’ve changed. Join me as I recap my Summit journey. Look for the white alligator – and stay out of the JIRA swamp! Will you be at Atlassian Summit 2016, in San Jose, California, the week of October 10, 2016? Come by and meet Rachel Wright, author of the JIRA Strategy Admin Workbook! Walking the conference floor, attending sessions, and enjoying Summit!